I'm sitting, peddling, shaking, typing - all at my desk - in search of the "zone." The zone, you see, is an ellipsis. It's when you're deep in a project, busily ignorant of your surroundings, centered and focused on the task at hand. Enter: the Flexispot Deskcise Pro. 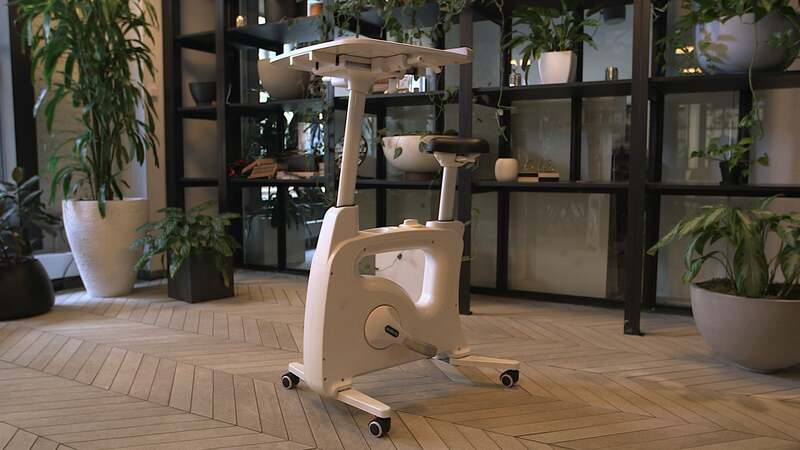 A graceful mashup of desk and exercise, the Flexispot Deskcise is a low impact stationary bike with an adjustable desk replacing the handlebars. For 2 days, I rode the Deskcise while working from the Gizmodo offices in New York. My goal was to fall into some sort of zen where I wouldn't realise I was pedalling a stationary bike in the middle of the office. Cheaper than a desk treadmill, the Flexispot similarly teases an ideal scenario: focusing on work, while the effort and tedium of traditional exercise fades away. It gets there, mostly. 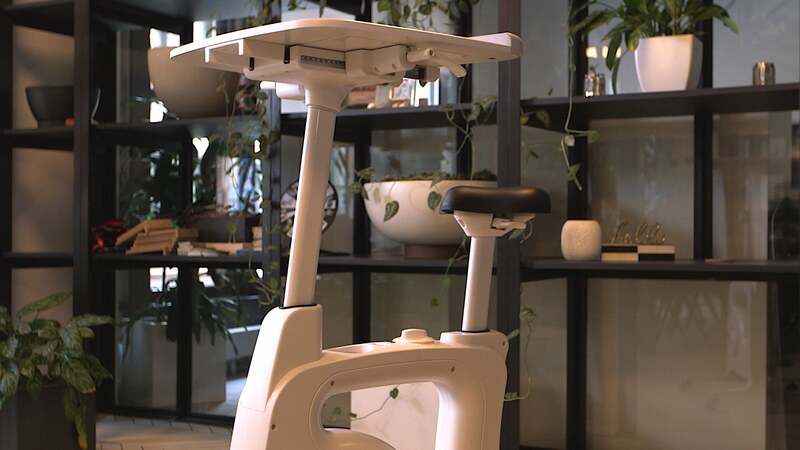 The Flexispot's price point, $US499 ($631), is much lower than the flashier counterparts in this space, which range from around a thousand to top shelf stuff like the $US2000 ($2,530) Peloton smart bike. The design isn't impressive though. Its anodyne off-white colour scheme is more likely to remind you of medical equipment than flashy cyber bikes or tech-y standing desks. Still, the seat is comfy even after prolonged riding and the desk itself is sturdy. There's a single LCD screen in the body of the bike — gracefully staring right in the rider's crotch area. Pressing a button, the screen cycles through a few stats: miles travelled, calories lost, how long you've been riding, etc. It's useful, but the placement baffles. It's also right next to the cupholder, similarly perched right in between your legs. What's going on with that? Of course, the bike is stationary so it's not a total danger, but who wants to risk accidentally knocking into their drink? The entire bike is designed assuming the rider is staring at the desk so, why not put the screen (and cupholder) somewhere on top? But that's not the real problem with the LCD screen. In the era of pulse-monitoring wearables and finger-vein biometrics, the calorie readings the bike's LCD display provide are guesswork. Calories burned are seemingly a function of how quick you peddle, not actual effort. Even when I peddled comically slow on the lowest resistance, the screen would reward me with points. I'm not a triathlete, but that seems unacceptable in an age of constantly updating smart devices. The Flexispot succeeds in being simple, not smart. It's sturdily made and, in what I'm sure is a boon to older uses, takes only moments to set up. It makes sense even if the placement of the display and cupholder are bad. 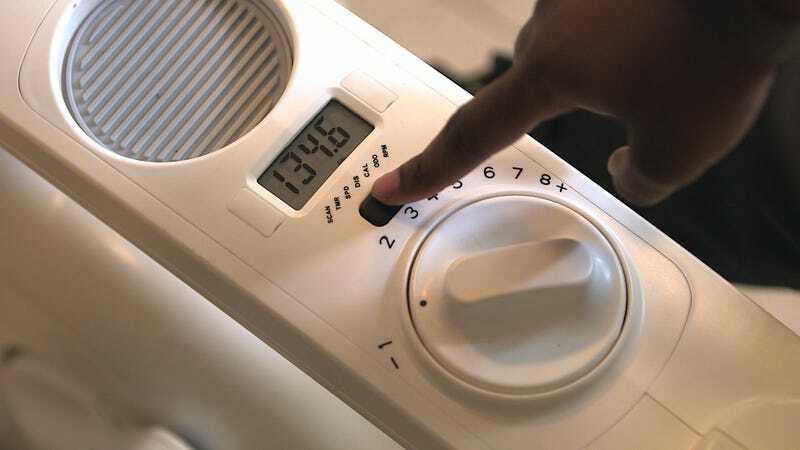 You know the first time you heard of smart lights, smartcars or smart toilets and you had to either look up or ask someone what exactly they were? This isn't that. 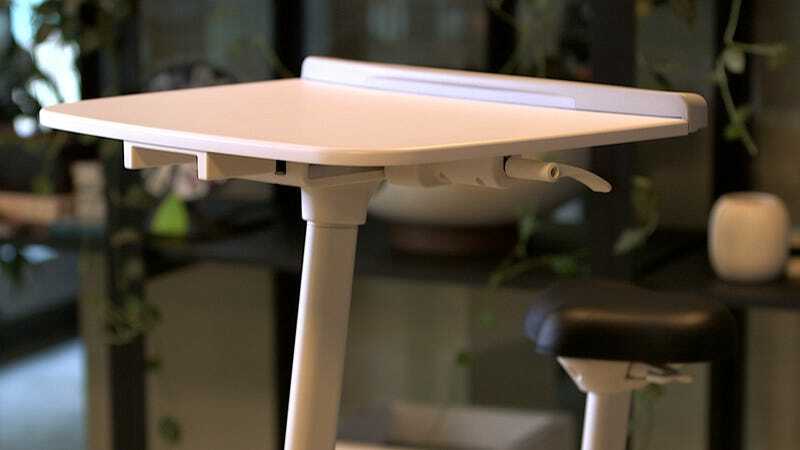 If you know what a standing desk is, you know what this is. 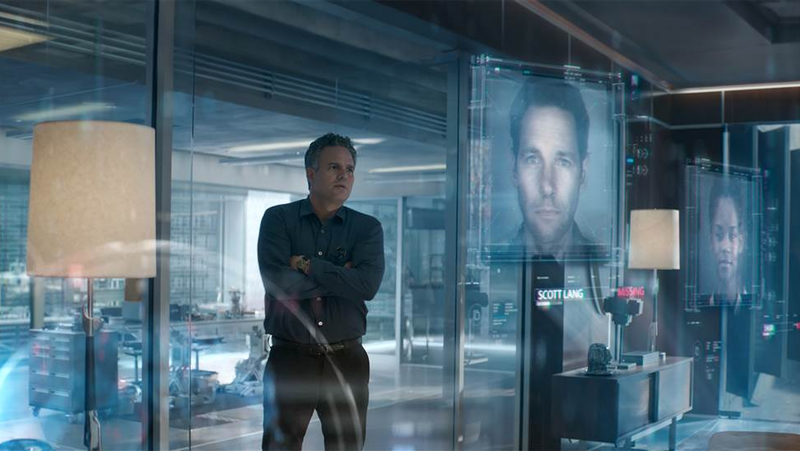 But "smart" has come to define much of the consumer electronics space in the past few years. A lot of it's a gimmick, but exercise is something that sorta has to be looked at longitudinally. Are you gaining or losing weight? Are you getting tired or cycling for longer? Which level of resistance best tracks with your exercise goals? The Flexispot is deliberate in what it does in terms of function: this is a low-tech, no frills device for families. But ironically, health is the one space where all the panoptic frills of smart devices seem appropriate. Again, not a triathlete, but I suspect there's a baser need at play here. The need to have everything count. When you're out of shape, progress to the healthier you seems gradual, if nonexistent. Smart devices fulfil a real desire to quantify every movement. If it's not counted and calculated, it feels like it just doesn't count. It's a gimmick, sure, but one we've come to rely on. 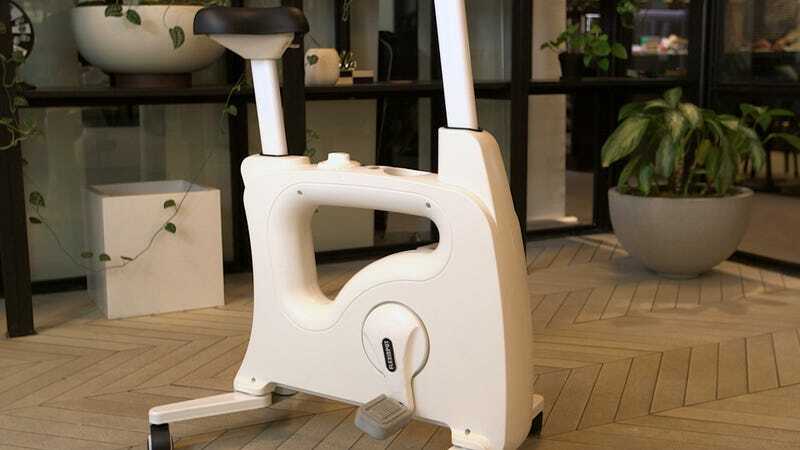 That said, the Deskcise delivers on the basics - it's a stationary bike that you can pull out while streaming a movie on a laptop or playing a game. Having some sort of on-screen, connected device or app would help connect what you're looking at with what your body is doing, but the bike is simple, solid, and in an era of flash, strong on the basics. If you want something more you should probably buy a Fitbit. The desk is wide, which is great, but putting the LCD screen in between the rider's legs is ....?